At 91, Shoemaker To The Stars Is Still In Business The man behind Charlton Heston's sandals in The Ten Commandments is 91-year-old Willie Rivera, who began making shoes at the age of 13 in Mexico City. He moved to Los Angeles in the 1950s and has dressed the feet of legends such as Fred Astaire, Bing Crosby, Lily Tomlin and Bill Cosby. 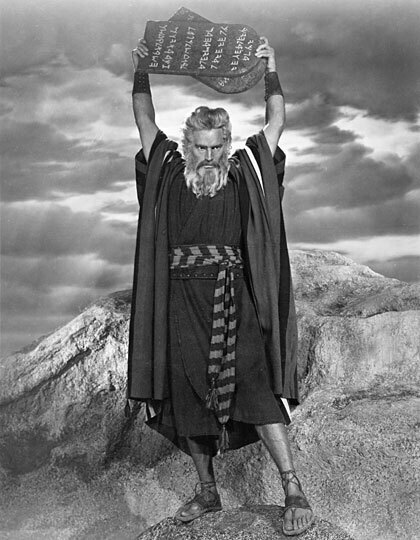 Rivera created the sandals Charlton Heston wore as Moses in the classic 1956 film The Ten Commandments. Meet more of the people who make Hollywood work: Browse Susan Stamberg's earlier 'Hollywood Jobs' stories. 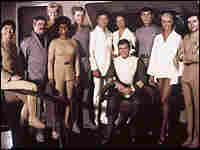 The cast members of the 1979 film Star Trek: The Motion Picture show off the shoes designed by Rivera. 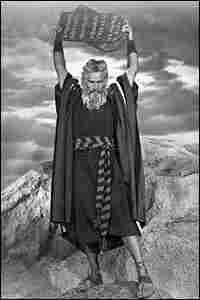 When Charlton Heston played Moses in the classic 1956 film The Ten Commandments, he was wearing sandals that might have withstood wandering 40 years in the desert. That's because his sandals were made by Willie Rivera, a Hollywood shoemaker. And Willie developed a reputation. In the 1950s, Rivera was working at Western Costume, the big Hollywood wardrobe house. Rivera's job was to make sample shoes from scratch from designer's drawings. One day, Fred Astaire's shoe burst open while he was dancing on a set. The shoe was rushed over to Western Costume for repair, but Rivera's boss couldn't figure out how to fix it. Rivera said he could. And he did. Astaire was so impressed, he had Rivera make his own personal shoes — size 8 1/2 narrow. 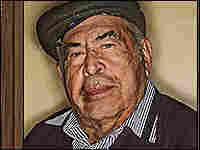 Rivera, 91, grew up in Mexico City. "I learned the shoe business because my grandfather and my uncles were shoemakers," he says. When Rivera finished grammar school at age 10, his parents asked him what he wanted to do. "So I said, 'I wanna be a shoemaker.' And I started to learn to be a shoemaker when I was 13 years old. And ever since, I love my trade, and I'm very happy." As a young man in his 30s, Rivera came to California and landed a job at Western Costume. But he only stayed for four years. Rivera rented a shop across the street from his employer and opened his own shoe business. A week later, Paramount Studios — just across the street — switched its account from Western Costume to Willie's Shoe Service. His very first commission was The Ten Commandments. And then came a tidal wave of orders. After The Ten Commandments, Rivera did boots for more Westerns than he can count. And he made shoes for everyone in the first Star Trek films. 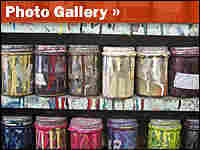 But his space was getting too small, so he moved to a bigger shop in Hollywood — on Cahuenga Boulevard. The back of Willie's Shoe Service looks like a launchpad for the Industrial Revolution — ancient, grimy machinery for sanding, hammering, stretching and gluing. And, of course, there are shoes, including 5-inch stiletto heels and black-studded leather boots. The front room is lined with framed 8-by-10 glossies of famous customers, all autographed to Willie — from Lily Tomlin, Bill Cosby, Raquel Welch, Bing Crosby and many others. But long gone are the days when Hollywood made shoes from scratch. Now, it's much cheaper for designers to buy ready-made shoes and have a place like Willie's alter them. A few years ago, Rivera was thinking about retiring and closing the shop. Then he met a young man named Raul Ojeda. Ojeda and his brother were working as shoe shiners in Century City. One day, they stumbled across Rivera's shop and found out that he still made custom shoes. "And I wanted to learn how to make shoes," says Ojeda, "and I started to volunteer my work every Saturday." Ojeda apprenticed with Rivera, and two years ago, he became the store's manager. Ojeda has four full-time employees, who service local folks and Hollywood types. The shop recently altered shoes for Iron Man, Walk Hard, Balls of Fury and the new Star Trek movie, due out soon. Ojeda also modified some vintage 1930s shoes for the forthcoming film Public Enemies, starring Johnny Depp as gangster John Dillinger. The designer phoned Ojeda from Chicago saying the movie needed a lot of work done ASAP. "So they FedEx'd 70 shoes from Chicago," Ojeda explains, "and we finished everything the next morning and FedEx'd everything back in one day." In addition to rush jobs, they still do some time-consuming, made-to-measure custom work at Willie's. 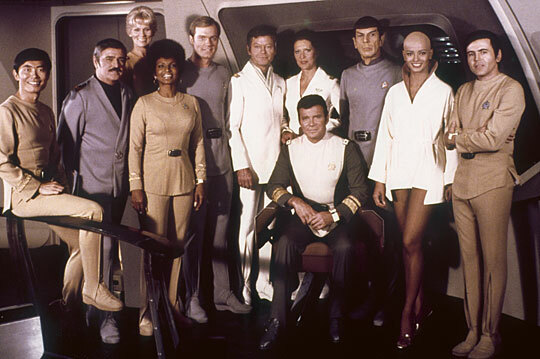 Some Star Trek fans wanted boots exactly like the ones in the films. The boots cost $800 a pair. Ojeda says that was a deal, considering the materials and work. The shop also has a wooden model of the Rev. Jesse Jackson's foot — size 12 1/2. Jackson has ordered some 20 pairs of shoes from Willie's over the years. He phones in his orders. Even though Rivera doesn't work daily in the shop anymore, he's always coming by to check on things. And still today, when movies need to put an actor in someone else's shoes, they count on Willie's Shoe Service to do the job.